On the PDXpert Technical Support window, note the methods for contacting us. To help find errors, the PDXpert Application Server and the PDXpert client record ("log") their activities. As described below, you normally click a Save Log Files button, which is available in the server and client. However, in some cases you may need to go to a Windows folder to obtain the log files. In this case, you'll go to an "environment variable" location such as the %ProgramData% folder. Windows expands these variables into actual file paths as needed. Open File Explorer and type the value into the address bar and then press the Enter key. Enter the value into the Windows Start menu's search box and then press the Enter key. 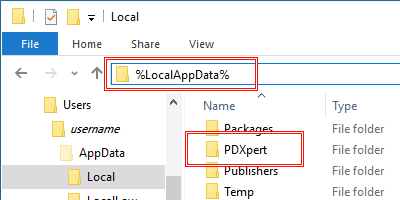 The PDXpert Services and the PDXpert Application Server application log files contain a record of normal and unusual events. The target files are created only on the computer where the PDXpert Application Server has been installed. Open the PDXpert Server console. On the Manage tab, click on the Save Log Files button, and save the file to a convenient location. If the PDXpert Application Server console can't be opened or is unresponsive, find the log files. Locate the target log files folder in Windows Explorer (described above). In Windows Explorer, right-click the log files' folder and select Copy from the context menu. Right-click on an open area of your Windows Desktop and select Paste from the context menu. Right-click and select Send to > Compressed (zipped) folder to create a Logs.zip file. The PDXpert client log file contains a record of normal and unusual application events. The client target file is created only on a workstation with the PDXpert client installed. Run the PDXpert PLM client application. On the PDXpert log-in window, click the Options button. Click on the Save Log Files button, and save the file to a convenient location. On the Help menu, select the Technical Support... command. On the Technical Support window, click on the Save Log Files button, and save the file to a convenient location. If the PDXpert PLM client application can't be opened or is unresponsive, find the log files. Locate the environmental folder in Windows Explorer (described above).